In this review we express our concerns with the JH. 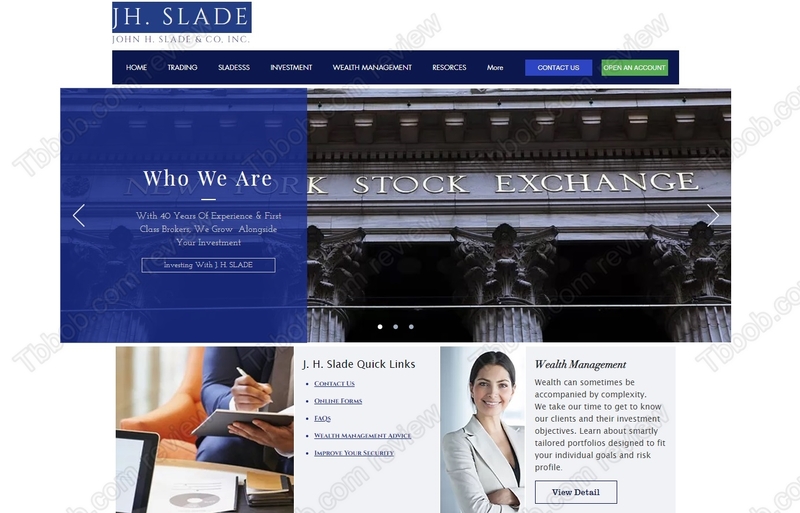 Slade investment company. JH. 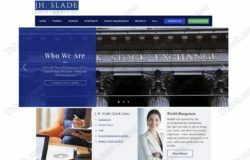 Slade or John H. Slade & Co. Inc. at johnslade.com is supposed to be an investment and wealth management company. It will allow you to trade financial markets, manage your account and it even has retirement and fix income plans. The company allegedly is a member of the New York Stock Exchange and is a stock broker since 1940. We immediately saw there was something fishy about the website at johnslade.com, so we investigated a little further and identified several red flags. The fact is that there was a certain John H. Slade who traded at the New York Stock Exchange, but he passed away in 2005. We found no real company of his name that would continue his business. Certainly no company of this name registered with the Securities and Exchange Commission. The johnslade.com domain was registered only in August 2018. The links to social profile on that website are blank. The link to some critical documents at the bottom of the page are not working. And the phone number provided by JH. Slade leads to Medi Oasis Health Services. All this makes us believe that JH. Slade is a scam, a boiler room that abuses a famous name. JH. Slade obviously is not a genuine investment company, it looks like a simple scam to get your money. In trading an investing be sure to work with regulated companies only. Cryptocurrency scam JH. Slade, John H. Slade & Co. Inc.
“Thank you for contacting the U.S. Securities and Exchange Commission (SEC). A search of our databases indicates that John H. Slade and Co. is not registered with the SEC. I have reviewed the website you have provided, https://www.jhslade.com, and it raises a number of additional “red flags” that suggest it is a fraud. For example, the firm states it is a “member of the NY Stock Exchange” (NYSE) – however, the firm is not included in the NYSE directory available at https://www.nyse.com/markets/nyse/membership#directory. The address provided for the firm – 30 Wall Street, 8th Floor – is owned by a company offering ‘virtual office’ space. As you may be aware, one of the more common types of fraudulent schemes directed at non-U.S. investors by entities falsely claiming to be registered with the SEC involves requests that investors pay a fee in advance as a condition of closing a proposed transaction (referred to as advance fee fraud). After the investor pays the advance fee or similar fees, the entity typically breaks off contact. In the end, the proposed transaction does not take place, and the investor is never paid — and never recovers — the fees paid in advance. For more information on advance fee frauds and other types of scams, see Advance Fee Schemes, available at https://www.investor.gov/additional-resources/news-alerts/alerts-bulletins/updated-investor-alert-be-lookout-advance-fee. Thank you for taking the time to check the veracity of the firm before investing. For links to databases of U.S. registered brokerage firms, brokers, and investment advisers, please consult our online publication Protect Your Money: Check out Brokers and Investment Advisers, available at http://www.sec.gov/investor/brokers.htm. That publication explains how you can use our Investment Adviser Public Disclosure database at https://www.adviserinfo.sec.gov/IAPD/Default.aspx to find information about individual and firm registration. You should also make sure that a firm is registered with your home country before making the decision to invest. To find out whether a financial services firm is registered in your home country, please consult the list of international financial regulators and their contact information at http://www.utoledo.edu/law/library/financialregulators.html. An additional source of information about firms or entities that claim to be, but are not, registered with the SEC is the SECs Public Alert: Unregistered Soliciting Entities (PAUSE) webpage at http://www.sec.gov/investor/oiepauselist.htm. The PAUSE list includes entities that have been the subject of investor complaints and for which SEC staff has determined that (i) there is no U.S. registered securities firm with this name, or (ii) there is a U.S. registered securities firm with the same (or a similar) name, but solicitations appear to have been made by persons who are not affiliated with the U.S. registered securities firm. If you have any questions, please contact me by replying to this email (help@sec.gov) or as noted below. Such an amateurish analysis if, on the part of our ignorant boy Mr. Novak’s. who would dare even expect for it!? But from you as a lawyer, will we not demand it? Let alone look at it that somewhat of depth and wit. And if we’re already discussing the matter; in an aside, it should be noted that it appears The learned lady did not memorize her teaching at all. Lawyers, Accountants, Engineers, and Teachers. 4. SEC. b. Mid-Sized Advisers. Advisers with less than $25 million of assets under management are regulated via its states. 5. Regarding the idiot Novak maintaining Finra again and again – It’s from $100 million and up you idiot! Those are not subject to the assets under management thresholds. 4. Dodd-Frank Act – replaces the private adviser exemption for aggregate assets under management attributable to these clients and investors of less than $25 million and does not hold itself to the public in the United States as an investment adviser. available to a non-U.S. adviser to act under the venture capital funds. Considering the fact that we are neither a bank nor advisory firm, nor have we 25 million under management and not even a single US client nor 15. John H. Slade & Co. Inc.